One of the most luxurious beauty treatments available today is the Gold Facial where 24K gold leaf is applied onto your face. Gold was used in ancient times for its healing properties. It is believed that Cleopatra covered her face in gold masks daily in order to maintain her youthful skin. 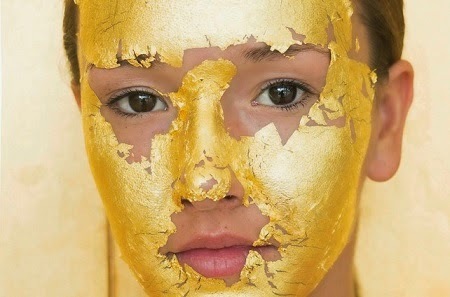 But seriously, how many of us can afford gold facials?! 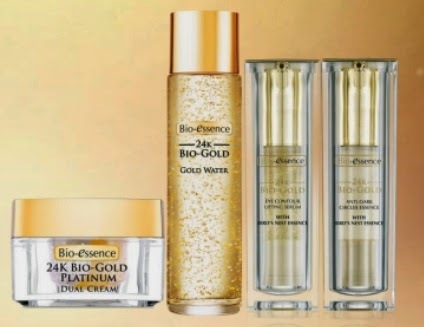 With the Bio-Essence 24K Bio-gold range, I can afford to indulge my skin with gold every single day. The 24K Bio-Gold Gold Water costs $45.00 for a 150ml bottle, and the 24K Bio-Gold Platinum Dual Cream costs $42 for a 40g tub. 24K Bio-Gold and Bio-Platinum are powerful and superior anti-oxidants that helps to fight free radicals and to defy premature ageing. 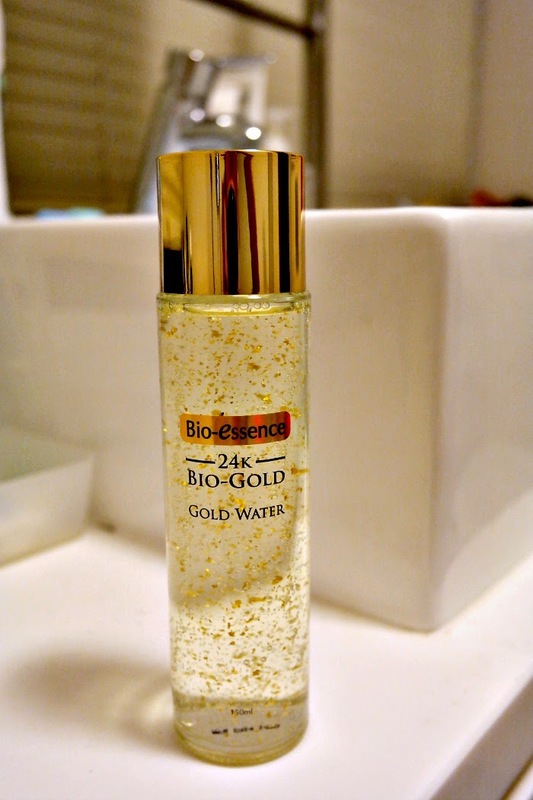 The Gold Water contains 24K Bio-Gold flakes. This is real gold! And there's so much of it suspended in this bottle. I use it twice a day (morning & night) before I use the 24K Bio-Gold Platinum Dual Cream. I feel that my skin is finer and smoother now even after just 1 week. It has also improved my skin’s elasticity because I can feel that my skin is firmer and more plump. Another reason I love this is because I naturally have dehydrated skin with some oily regions (!! 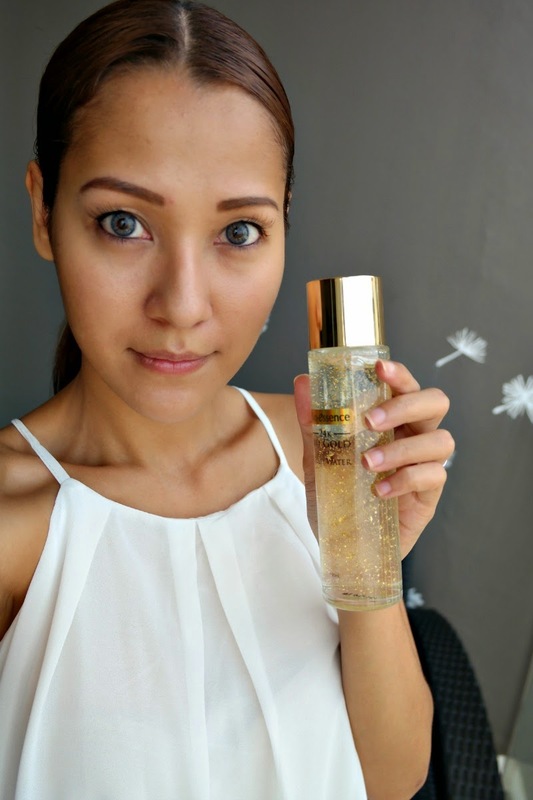 ), but Gold Water helps to regulate moisture & sebum balance, leaving skin moisturized and matte. So throughout the day, I have a fresh and radiant complexion. Here's a close up of an actual 24K real gold flake from my bottle of Gold Water. What luxury! Here's a pic of the Gold Water on my cheek, before patting/massaging it in. You can see the specks of gold on my skin. The 24K Bio-Gold flakes easily disintegrate into my skin with gentle tapping or a light massage, until everything is absorbed. 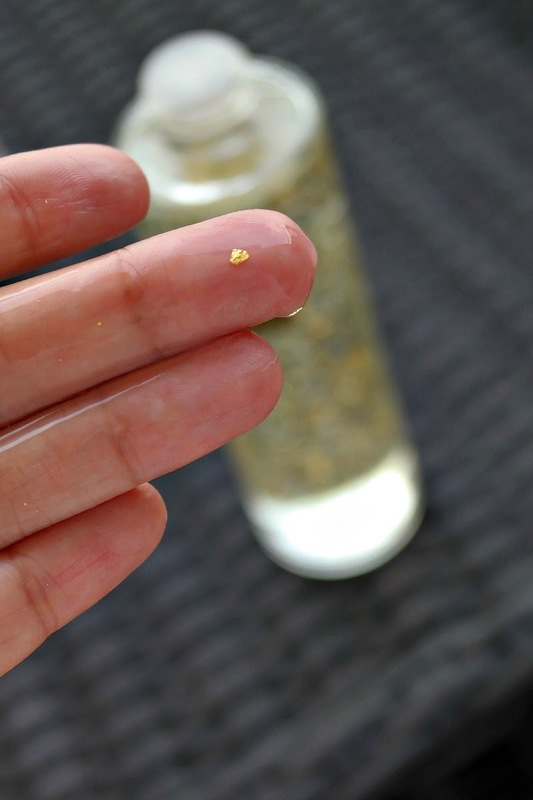 It's quite amazing that the bio gold flakes can actually be absorbed right into my skin. The 24K Bio-Gold Platinum Dual Cream comprises of Bio-Platinum Day Cream and 24K Bio-Gold Night Cream. As you can see, the tub has 2 sections, one with the day cream and another with the night cream. This gives me 2x anti-oxidant power to protect skin from environmental damages. 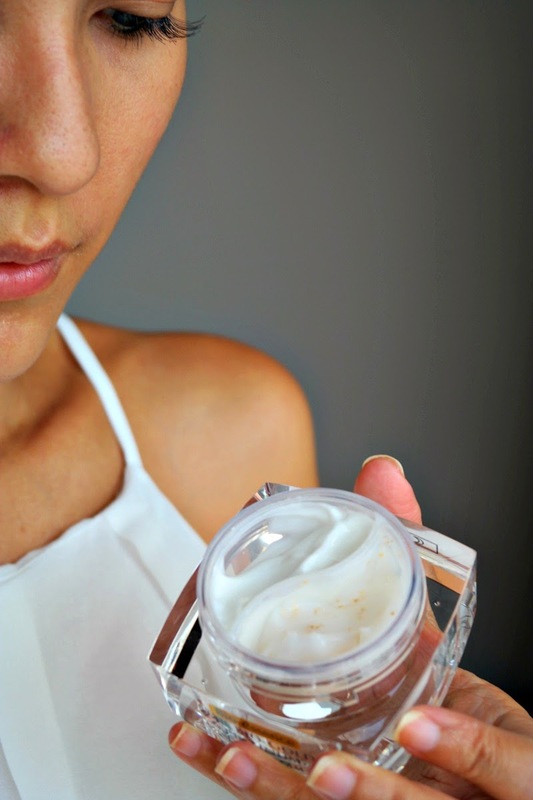 The day cream is creamy white and it contains Nano Bio-Platinum. These are flakes of platinum but I couldn't really capture the platinum specks in the cream with my camera. Nano Bio-Platinum can be rapidly absorbed by face because it's so fine. This cream is great for the day as it contains SPF25/PA+++ to prevent skin damages caused by UV rays. It's non-greasy, I can use my make up straight after, and still feel hydrated, and moisturized. 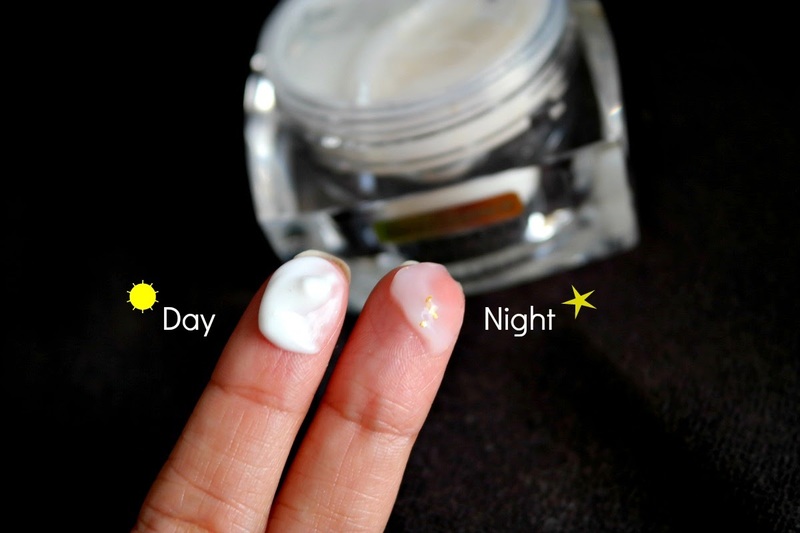 The night cream looks more transparent and gel like, it also feels more fluid. Yet it is amazingly emollient! It gives my skin intensive moisture and stimulates skin renewal through the night as I sleep. There are flakes of 24K Bio-Gold in it which is easily absorbed into the skin to improve elasticity. Gold has high anti-oxidant power, and fights free radicals to combat premature aging. For me, I find that it helps reduce and prevents fine lines and wrinkles on my face and neck, and prevents dryness to give me a younger looking complexion. I love waking up in the morning with skin that glows naturally and looks so much healthier than before. Don't forget to apply these products to you neck area as well because you neck is prone to wrinkles as you age, and it can really show signs of aging! Both the 24K Bio-Gold Gold Water and 24K Bio-Gold Platinum Dual Cream are a complementary duo to be used in your skincare regime (on face and neck) for youthful glowing skin. 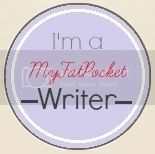 So a recap... here's what I do after cleansing. You can get these products at Watsons, Guardian, Robinsons, John Little, NTUC Fairprice, C K Department Store, OG, Sheng Siong, BHG, SASA and selected mini cosmetic houses.